While it seems easy to find articles suggesting that the “Sky Is Falling” or a recession is right around the corner, some assets are reflecting positive patterns and breakouts. 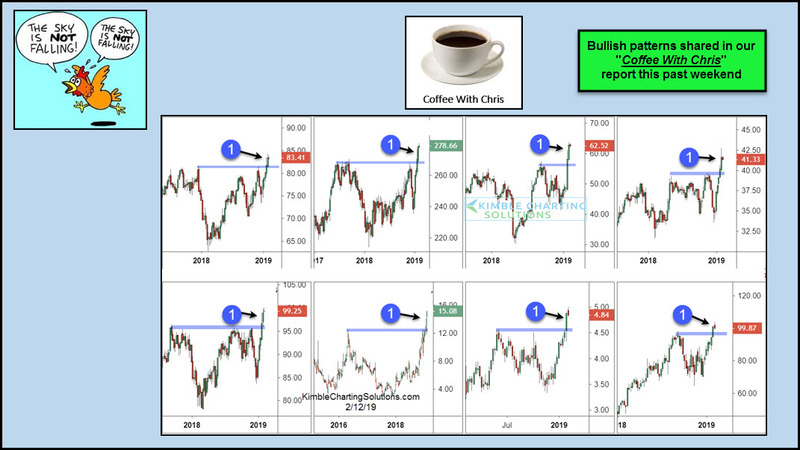 This past weekend in our “Coffee With Chris” report, these eight assets were shared with our members. Each asset above is working on bullish breakouts above old resistance at each (1). As the same time these assets were breaking out, two different Advance/Decline lines were experiencing similar patterns (upside breakouts). If you would like to know what these assets are or would like a free copy of our Coffee With Chris report, send an email to Services@kimblechartingsolutions.com and we will send you a copy of this report.